Now this little place in here is a keeper. Famous for what it is called. 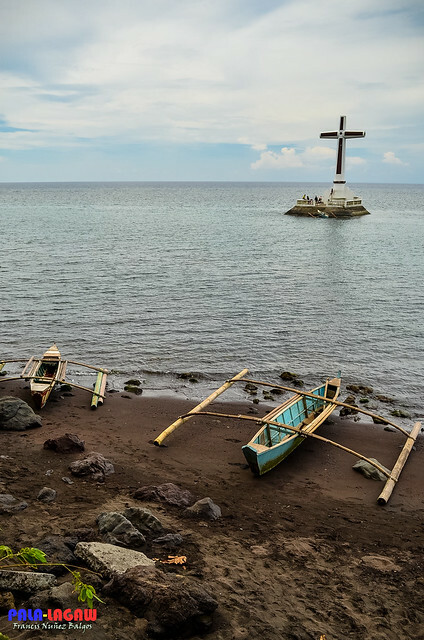 A cemetery was buried underwater following the eruption of one of Camiguin's active Volcano. They can still be viewed by snorkeling, which I didn't do. 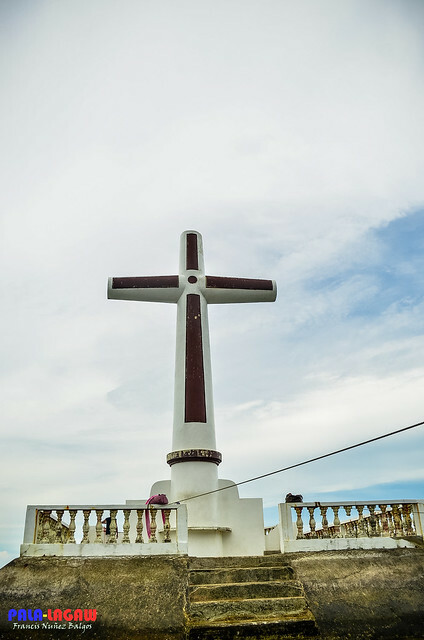 The big cross is more like a landmark of the place, a nice piece considering that a lot of folks come here and take pictures, judging by its location, this place provide a spectacular view of the sunset if the time is perfect, unfortunately for me, I was here on a lunch time on a cloudy day. I took lunch by the restaurant here as recommended by our guide Kuya Jojo. 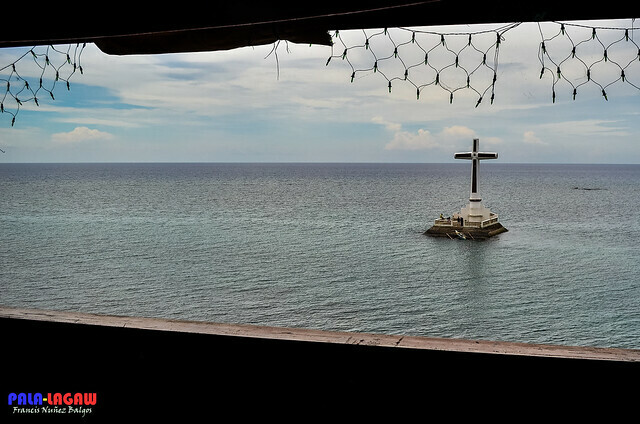 We selected what we want to eat, and they'll prepare it while we ride a ferry to inspect the big cross as seen below. 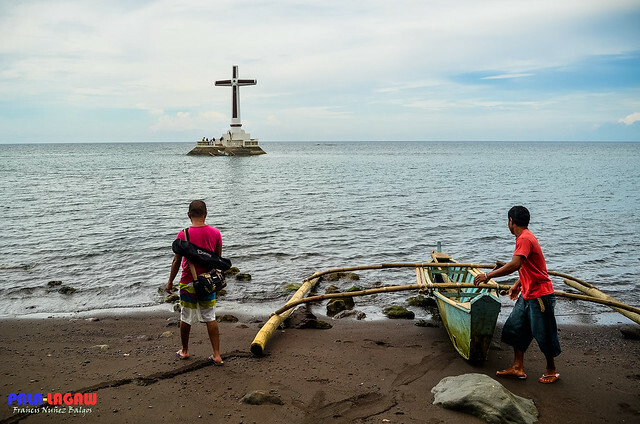 The cross is not very far from the shore but it would be tiresome if you opt to swim, the boat trip is Php 20.00 per head. Not bad really as the boatman could also serve as photographer to some trick shots that tourist normally like to take. A view from the restaurant. 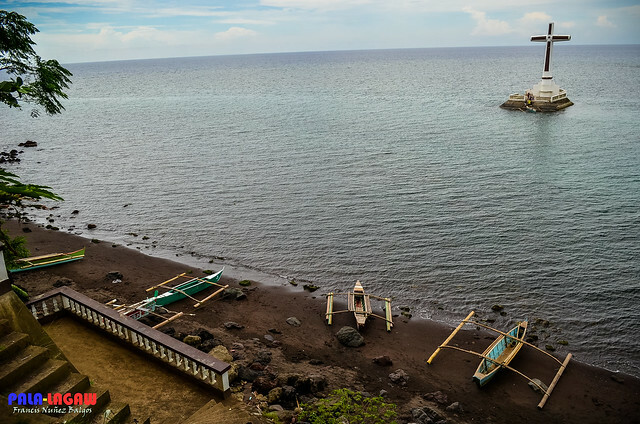 From above here, it looks lonesome and mysterious, which probably added to the charm of Camiguin. 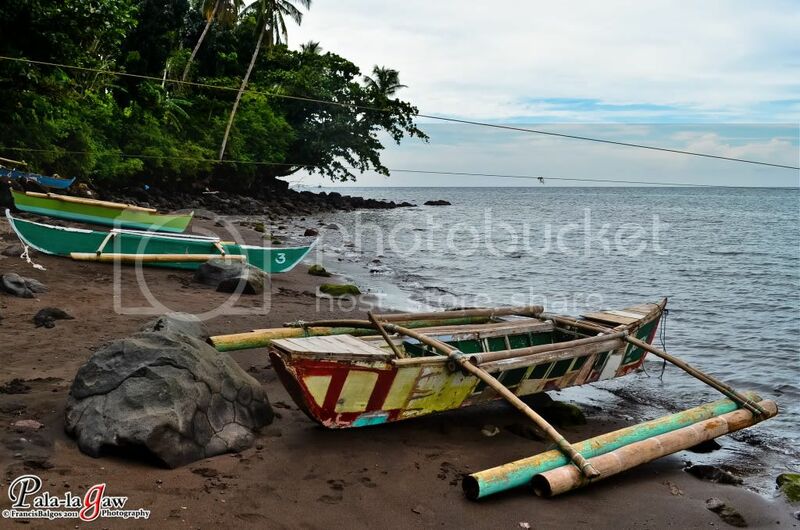 Black sand beaches, big slabs of volcanic rocks strewn all over and small boats makes it picture worthy. Several ropes tie the landmark to the shore, it helps guide boatmen on this short trip, I find it more of a distraction but its probably easier for people who make a living like this. You can see that the landmark is overlooking Mt Vulcan and Mt Hibok Hibok. 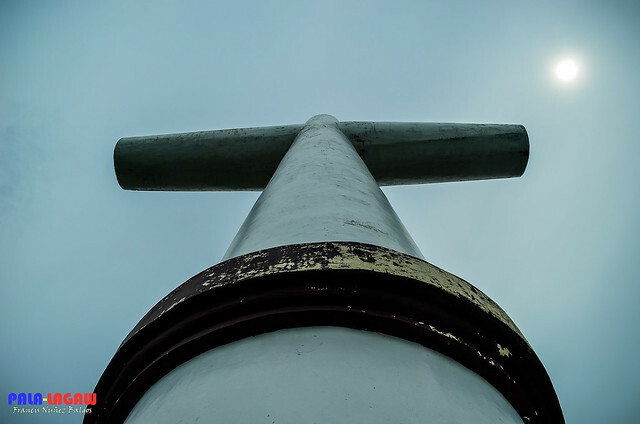 Looking up, the site is a really big cross, I have no idea of its dimension and I certainly didn't come here to pray, it has its effect though for religious fanatics. 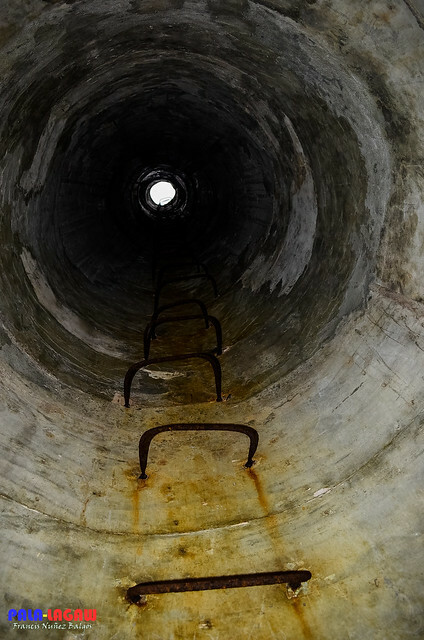 Inside the circular tube is a hollowed opening with rusty rods for stairs. nice shots. 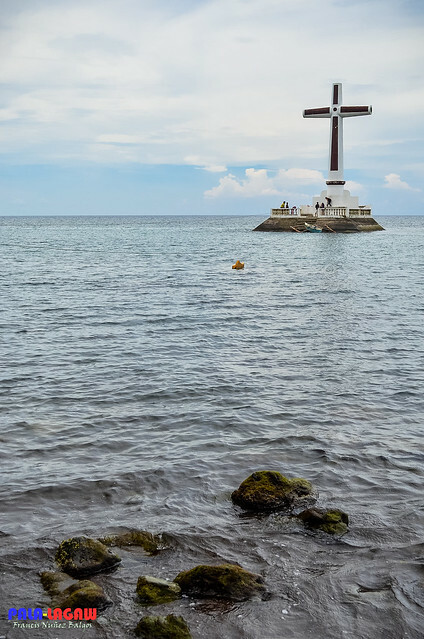 that's one of the things i regret, tinamad kasi akong lumapit sa cross..
@Chyng - kung me time lang ako, ng snorkel din ako.. pero ini imagine ko palang.. creepy! hehehe! @Mervs - kung pinayagan lang ako, I would have tried the stairs.. pero delikado daw eh. Hi. This one's for you. Pala lagaw eh?! Taga diin ka? hehe! I love your blog. Wish i could visit this place too. Keep blogging. I'm thankful for fbw's comment exchanges, I stumble so many lovely photos today. Would you care to join www.postcard-perfect.com? Truly lovely photos, postcard perfect! Hahaha! 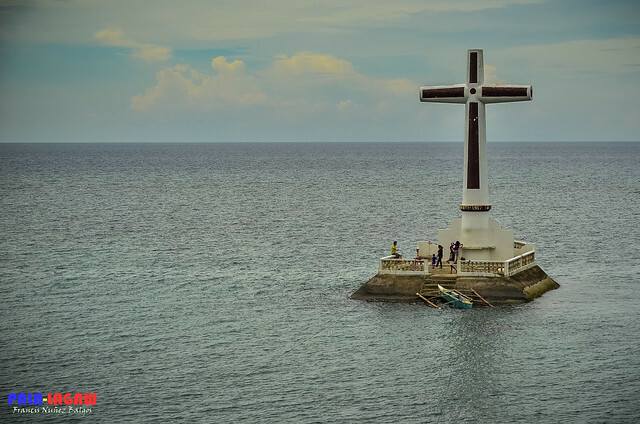 I should rather spare 20 pesos for the boat than to swim going to that cross. Besides, I do not know how to swim, so I should have a life vest when am going to that place. 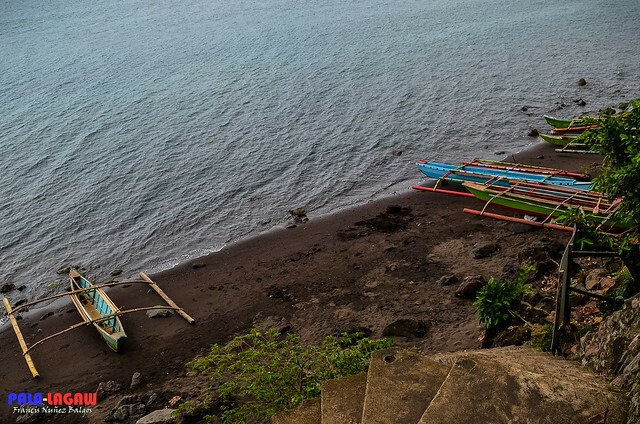 Phils sure have plenty of scenic spots...would love to visit Camiguin one day...thanks for the share! cool shots. like the variety. 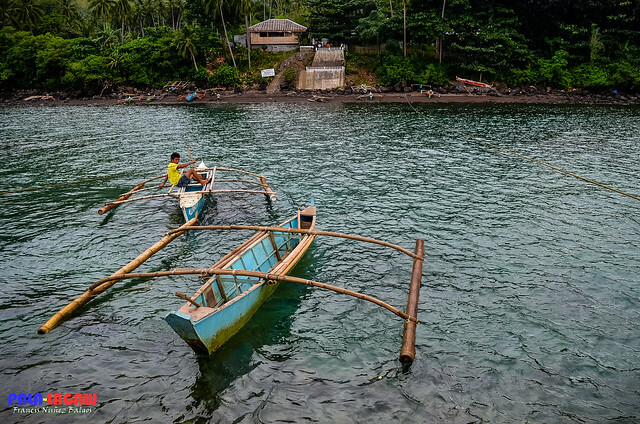 Since I don't know how to swim ,i would rather pay for a boatman even if i pay more than 20 pesos .I wonder what the underground cemetery looks like. I wish I can visit there someday! Thanks! Looks freaky! I wonder what you'll see if you active snorkel there. I think I'd be sooo freaked out if I see tombstones! I can't help but think about souls who'll pull you down to drown :-s but that's just me and my active imagination! 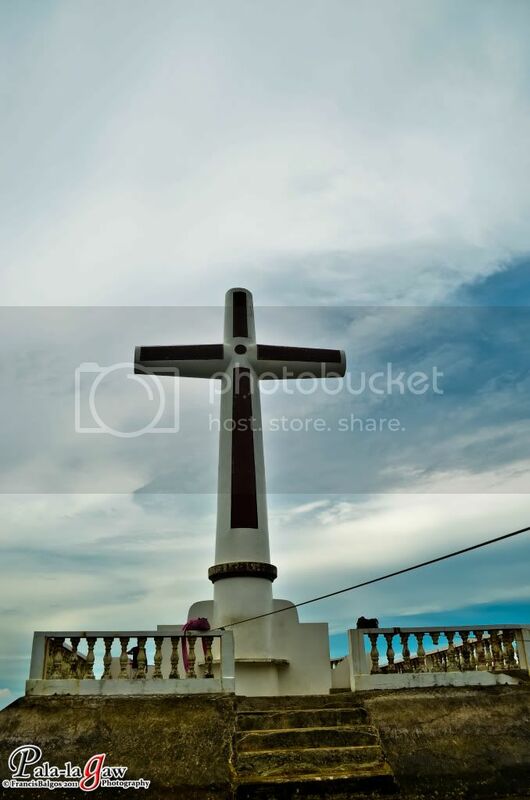 wanna climb to the tip of the giant cross!. ganda francis, mas-isa ka lang? I've been to Camuguin years ago a number of times but never visited that cross. I would love to visit that place again someday. What's the view when you climb the stairs inside the cross? i've been here last year pero di na ko lumapit sa cross. Great yet affordable trip. Will consider this in our itineraries. hmmm. this one is thrilling. Great shots! :) but I guess I'd take my chances and see how the sunken cemetery looks like...I'm very interested! will save Kuya Jojo's number. Thanks! I'll be posting Kuya Jojo's number.. This is also for me to show my gratitude for him. 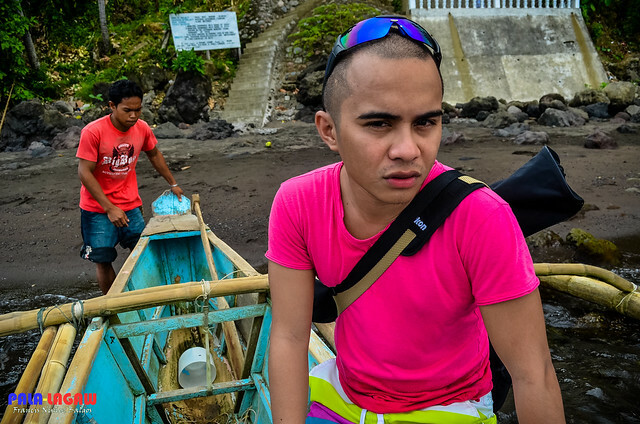 My Camiguin trip was pleasant though it just for a day..
Hindi pala ako pumasok or umakyat dun sa cross, rusty na yung rods for stairs, baka ma aksidente pako.. I have few more upcoming post about Camiguin including my itinerary and the awesome sunset as I bid goodbye to the island born of the fire. 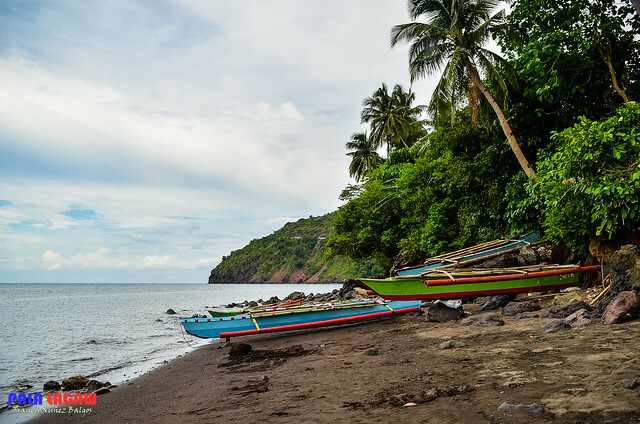 My friend have been to Philippines ones and she have never told me about this place. It's totally awesome. What else you can see there?